Home > University Economics > What causes the money supply to rise? What causes the money supply to rise? The money supply is the amount of money in circulation measured by narrow money (MO) and broad money (M4). Central Banks print more money. Banks choose to hold a lower liquidity ratio. This means banks will be willing to lend a larger proportion of their funds. Government sells bonds or bills to the non-banking sector. If the public buys anything from the government they will reduce their deposits in banks; there will be no expansion in the money supply. Expansionary fiscal policy. 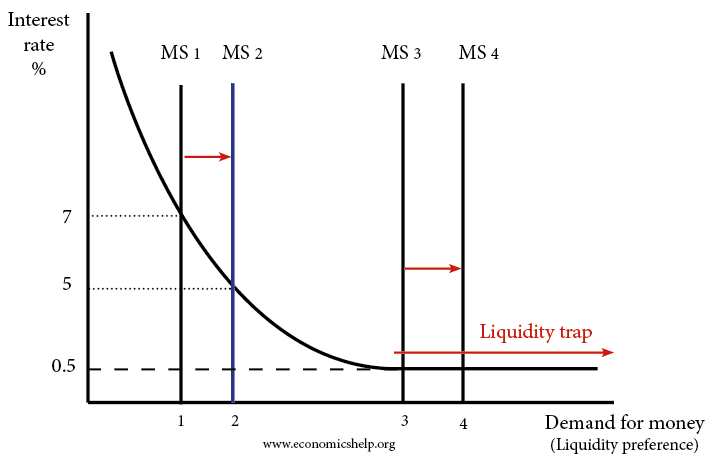 In a liquidity trap, a lower liquidity ratio may not increase the money supply – because banks don’t want to lend and firms don’t want to borrow. There is often a ‘paradox of thrift’ business, and consumers want to increase savings – and this leads to a fall in spending and investment. If the government borrows from the private sector and spends on public work investment schemes, then this will start a multiplier effect where households gain wages to spend and encourage private sector investment. This shows the components of a change in money supply. A change in money supply is a flow into or decrease into the money stock. If there is a currency flow surplus and hence a net inflow from abroad. Also included in item four is that part of the government borrowing that is funded by borrowing in foreign currency, this reduces the expansionary effect of the government borrowing. higher interest rates may attract deposits from overseas. What causes money supply to rise?